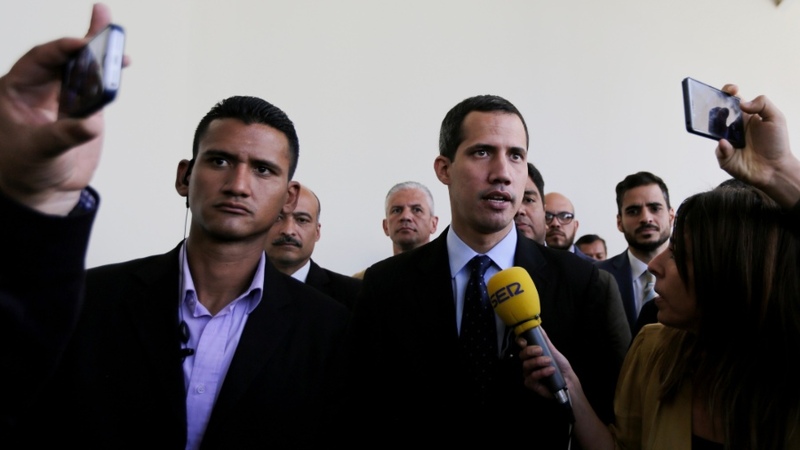 Opposition National Assembly President Juan Guaido, who declared himself interim president of Venezuela, speaks with the media upon his arrival to National Assembly in Caracas, Venezuela, Tuesday, Jan. 29, 2019. Venezuela's chief prosecutor on Tuesday asked the country's top court to ban Guaido from leaving the country, launching a criminal probe into his anti-government activities. Meanwhile international pressure builds against President Nicolas Maduro. President Donald Trump addressed U.S. action in Venezuela, where people are abandoning socialist dictator Nicolás Maduro for an opposition leader, and warned U.S. citizens against traveling there. The U.S. recognized Maduro’s rival and took other steps in Venezuela since its National Assembly President Juan Guaido declared himself the country’s leader instead of Maduro on Jan. 23. Most recently, the U.S. announced sanctions against Venezuela’s state-owned oil monopoly PDVSA on Monday to pressure Maduro to step down. Oil is the backbone of Venezuela’s federal revenue and cutting off Maduro’s access to U.S. markets will cost his regime nearly $20 billion within one year. The sanctions will block PDVSA from accessing $7 billion worth of assets in the U.S. and cut Venezuela’s oil exports by $11 billion over the next year, national security adviser John Bolton said at a Monday press briefing. Maduro threatened to cut diplomatic ties with the U.S. Jan. 23 because the U.S. recognized Guaido. Brazil and Canada also recognized Guaido over Maduro. Maduro compared Brazilian President Jair Bolsonaro to former German dictator Adolf Hitler in a speech Jan. 14 after Brazil recognized Guaido.